I totally broke up with Twitter for Instagram. Because let's face it, pictures are pretty and words are, how do I say it... NOISY. My life is noisy. I wanted less info. More pretty. I like pretty. Plus I like taking pictures with my phone. A lot a lot a lot. Enough to make my poor big camera all sad and abandoned. Doesn't help that it is still fighting with my computer. 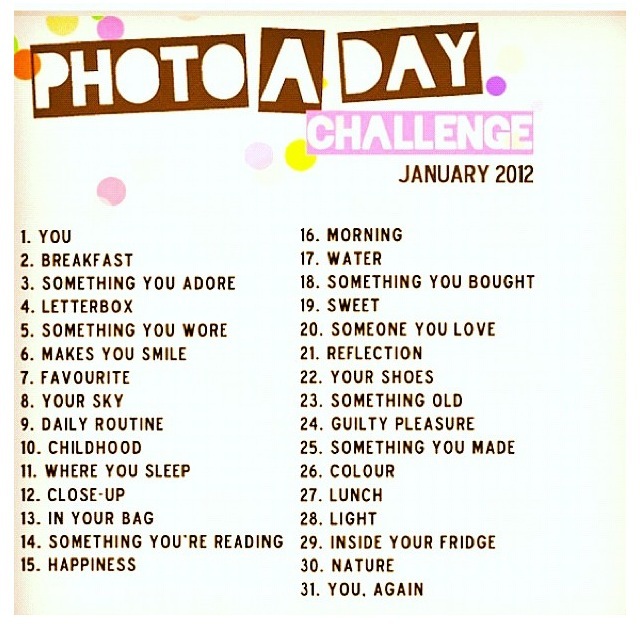 When I saw this little photo challenge come through my feed I thought it would be fun. An interesting way to start the new year. Some structure to the picture a day 365 (or 366 this year) plan that I start every year, then eventually, often quickly, quit. Some days I absolutely loved it. Thinking of different ways to interpret the daily prompt. Other days I groaned as things like mailboxes, on day four, filled my feed. Really? Mailboxes? Lots of mailboxes? The paranoid part of me did not want to snap a pic of mine, because who knows what murderer is one step away from a Dateline story as soon as they know where I live. Because all he was waiting for was a pic of my mailbox to carry out his evil plan. Then there was the inside of your fridge day. Ugh... Until I found kindred food friends who had things chilling, like my beloved almond milk, Cholula, and Sriracha. Less murdery. More hungry. I am fairly certain that I have never actually done something for 31 days straight. It might be a small accomplishment, but for this A.D.D. quitter, it is a big deal. As for the February challenge, I make no promises. But this happy January grid is off to be printed and maybe even put in a little scrapbook. Edited to add a little how to for the above collage. A little overly complicated how to. Because I rig stuff. I know just enough about a lot of things to get by. But not enough of one thing, to make it easy. This would be easy in Photoshop if I knew Photoshop. But I don't. I knew I wanted it to be square, so I mapped it out on a piece of paper. To break it down, I knew I needed nine 4x4 boxes. I spread out the white boxes strategically. Then each day I added the text to the photos with the Phonto app. I made the 4x4 collages with the PicFrame app. Then I uploaded the nine 4x4 collages to Picnik (R.I.P). Next, I sent it back to myself, added the January 2012 text with Phonto (totally hate all of the Picnik fonts). 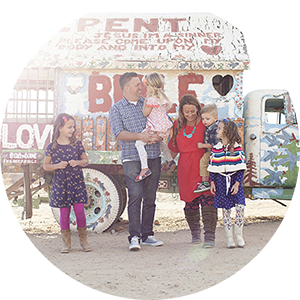 Then I sent it off to be printed as a 12x12. So you have it. My seemingly way too many step process to make a big old collage. Good luck! 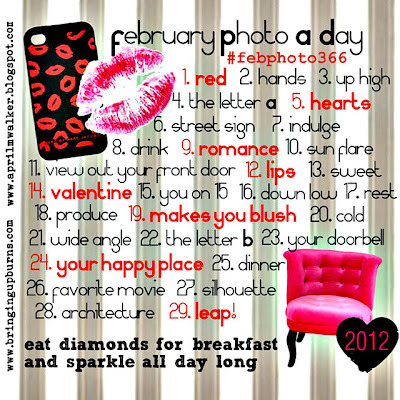 Feel like jumping in and snapping your way through February? I am going to be using the fun prompts thought up by my friends Erin and April. I also did this. It was fun! I love your collage and that you are printing it. What a great way to be reminded of January! i love love love your collage! i totally failed. i think i did about half...pretty darn typical for me. but i'm not giving up! i'm gonna give february a good college try. what am i saying, i didn't try in college...oh well. and i am so sad about picnik. why are they quitting us? and p.s. i had to bail on the fridge thing because i opened my fridge and realized it was going to be the most boring picture of all time. okay sorry for the novel. I just finished this challenge too, it was fun! Love that collage. I didn't do it for January but definitely thinking about doing it for February. Thanks for sharing that Phonto app! Looks like I'm going to LOVE it! i can't wrap my mind around how you can do all that but then say your mind will explode if you have to do the same thing over and over like knit. there's no thinking in repetition. there's way too much crazy thinking in that crazy collage. impressive amounts of thinking. Love your collage! 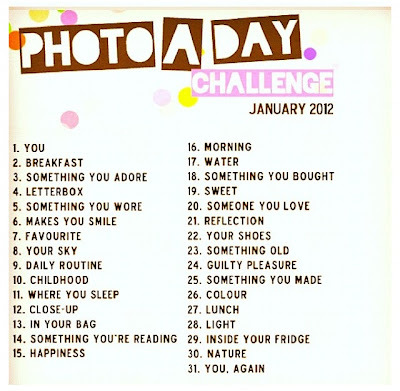 Can you point me to the February photo a day list? I'm thinking of giving it a try. Also, I'm so sad to be losing Picnik too! I use the Photogene app on my iPad to do all types of edits and create collages. I've been very happy with it. Love this! Might I ask what you plan on using now that Picnik is RIP?? I'm so bummed because I loved Picnik and I haven't been able to find anything equivalent that isn't like $500 photoshop software, ya know?! Dilemma for this mama, fo sho!! If only I had 1/1 millionth of your creativity! Love it!! Okay, I don't know why, but reading THIS explanation (as opposed to the one you wrote on Instagram), just finally made sense to me. Ha! Maybe it was the step-by-step way it was separated or maybe it's that I'm just REALLY slow. Ha!